This beautiful shawl from Bernat Yarns has striped detail in deep earth tones perfect for the Fall. This free crochet shawl pattern is for all skill levels and it will cozy up every outfit! It's perfect for wearing out on a walk or keeping you warm when you're sitting fireside. Looking for something a little brighter? Change out the colors for reds, purples, and oranges to create another beautiful fall shawl that's sure to please. 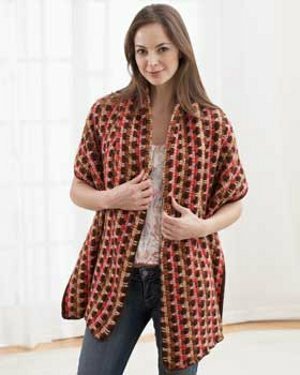 Making crochet shawl patterns for the fall and autumn is a great way to add transitional pieces to your wardrobe. While sweaters can overheat on particularly toasty fall days, shawls offer a breezy warmth that lets you breath while still keeping you covered. Find more easy crochet patterns that are perfect beginners in one of our favorite collections. 50+ Free Easy Crochet Patterns + Help for Beginners offers dozens of free crochet patterns of all shapes and sizes. Measurements: Approx 24 x 70 ins [61 x 178 cm]. Stripe Pat: Work 2 rows of each color in following sequence: A, B, C, A, D, E. These 12 rows form Stripe Pat. 1st row: (RS). 1 sc in 2nd ch from hook. 1 sc in each ch to end of ch. 226 sc. Turn. 2nd and alt rows: Ch 2 (does not count as st). 1 hdc in each st to end of row. Join B. Turn. First 2 rows of Stripe Pat are completed. 3rd row: With B, ch 1. 1 sc in each of first 3 hdc. *(Pulling long loop, 1 sc in next foundation ch two rows below – long sc made) twice. 1 sc in each of next 2 hdc. Rep from * to last 3 hdc. 1 sc in each of last 3 hdc. Turn. 5th row: With C, Ch 1. 1 sc in first hdc. *Long sc in each of next 2 hdc two rows below. 1 sc in each of next 2 hdc. Rep from * ending with 1 sc in last hdc. Join A. Turn. 7th row: With A, ch 1. 1 sc in each of first 3 hdc. *Long sc in each of next 2 hdc two rows below. 1 sc in each of next 2 hdc. Rep from * to last 3 hdc. 1 sc in each of last 3 hdc. Turn. 8th row: As 2nd row joining D at end of row. Keeping cont of Stripe Pat, rep 5th to 8th rows for pat until work from beg measures approx 24 ins [61 cm], ending with a WS row. Fasten off. Finishing: With RS facing join A with sl st to left corner of side edge. Work in sc across side edge of Shawl. Fasten off. Rep across other side. I am crazy about wraps and shawls. This one is no exception. The striped look of this "Autumn Shawl" gives it a little bit more of a sophisticated look. Really, just feel free to use ANY color combination to suit your taste. I would like to see this in shades of navy to violet to lilac. Another win! Hi Judie, Unfortunately we don't have a video for this particular project. We do, however, have a ton of other great crochet videos on our YouTube channel (just search FaveCraftsVideo). Also, be sure to check out AllFreeCrochet on YouTube for more patterns. Thanks! Do you have to use Bernat yarn? That is kind of out of my price range and Red Heart or TLC does the same thing for less money. I have a STASH of many kinds, but those are the two that I use most frequently. all even rows you use row 2 instructions and Odd rows use row use the numbers as indicated. I am wondering also about row numbering; I see there has been no answer yet? why is there no 4 & 6? I am curious about the row numbers. They read 1, 2, 3, 5, 7 and 8. Is this really just supposed to be the first six (6) rows? Thank you. For Cullyann: RS = right side, WS = wrong side, hdc - half double crochet, sl stitch = slip stitch. To do a half double crochet, yarn over and go into next stitch and pull yarn through ( 3 stitches on hook, then yo and pull through all 3 stitches. To do a slip stitch - put hook through next stitch, yarn over and pull through the one stitch on hook. Hope this helps you. cullyann: To the top left of the screen, go to: CATEGORIES>Crochet>Beginner Crochet. Under Beginner Crochet you should be able to find what you are looking for. RS-right side WS-wrong side hdc-half double crochet sl stitch-slip stitch You can visit our friends over at www.allfreecrochet.com for lots of helpful hints and tips!